Welcome to the first battle of the bands for March! Back in 1997, punk rockers The Offspring released this song for the first time. It was released as the second single for their fourth album. The song also appears on their Greatest Hits album. The song was written by their lead singer, Dexter Holland. The song became The Offspring's first No. 1 on the Hot Mainstream Rock Tracks, while reaching No. 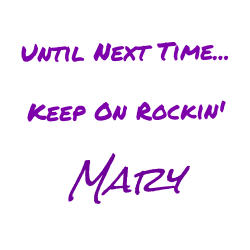 4 on the Hot Modern Rock Tracks chart. But today, The Offspring are not contenders. Instead, I have to fairly decent covers that are battling it out for title of best cover. 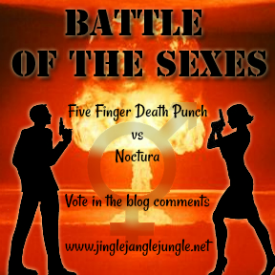 Please vote for either Noctura or Five Finger Death Punch in the comments. I’ll keep the voting open until Sunday, March 11 with results posted on Monday, March 12. There are no right or wrong votes, only those who do not cast a vote are the wrong votes. I’d like to encourage you to visit the other bloggers participating in the battle of the bands as well. You can find a current list on Stephen’s blog (you can also request to join the battle of the bands blog hop on his blog). DS introduced 5FDP to me and for a heavy metal band, I like their sound. I thought I would go with them this morning but after listening to Noctura I enjoyed the soft, less metal sound of this cover. The lead singer's style makes me think of Evanescence's lead singer, Amy Lee, a little. Give my vote to Noctura. BTW, I looked up the female lead (Mary Suiter) and learned she covered covered Evanescence's "All That I'm Living For". I think that's neat since she reminds me of Amy. :) Good battle and thanks for voting in my BoTB earlier this morning! It's always fun to introduce new sounds in battles. Glad that I could give you something a little more 'peaceful' to listen to this morning. Listening to this song I couldn't get the song "Mad World" out of my head. Don't they sound kind of melodically similar? They do to me at least. Noctura does a fine job, but I think Death Punch takes the song a notch above that version. More power and more convincing vocals. While not a fan of their band name, I'll cast a vote for Death Punch. I can see how you would think of "Mad World" especially with Noctura's version. It's probably that free-flowy sound that makes us think of that song. Thanks for stopping in for a vote! I checked on YouTube and there's a slew of mash-ups with both songs. I guess I'm not the only one who has made the connection. That is pretty cool. I checked out a few of those mashups from the link you provided. Your theory is spot on. >>... The Offspring ... The song also appears on their Greatest Hits album. How can a band I've never even heard of have a "Greatest Hits" album? >>... The singles "Don't Save Me" and "Fade" have gained airplay on various radio stations, most notably X103. X103? I've never heard of that, either. Are you sure that's not the comet that's been predicted to hit Earth in the year 2050? I'm with Lee on the name of 5FDP. I remember the first time I heard it and being immediately turned off, thinking: Yeah, that's what this world needs -- more violent references and imagery in the arts. But unlike Lee, I'm not voting for them. I'll take NOCTURA. I didn't feel like the song really went anywhere in their hands -- it probably could have been structured a bit more dynamically (with the gradual addition of more instruments as the song went along), but it was easy on the ears. Unlike 5FDP which, in my personal opinion, just sounded trite. It was that same old "Power Ballad" sound that I feel was already worn out before the 1980s came to an end. I, too, agree with Lee about the name of 5FDP, but I do like listening to their music from time to time. I suddenly have a hankering for that Bourbon Ice Cream you've been talking about. Too bad I couldn't find any at my last visit to the grocery store. I'd fix me a Hot Toddy Shake (is that a thing?) to kill this @#$@# cold that I've got. But I will say that, although the music sounded like noise to me, the video was pretty funny. Some people sometimes make me ashamed to be White. Oh, I very nearly literally fell down on the floor laughing. Well, that tattoo certainly challenged her to prove whether or not she could really live life without regrets, didn't it? Ha-Ha-Ha-larious! Ooh! I'm an ice cream junkie. There are only three types of ice cream: Good, Better, & Best. That Bourbon ice cream is BEST! It's like frosty, sugary whiskey. And it tastes so Bourbon-y that it's hard to believe one couldn't actually get drunk on it. I think a "Hot Toddy Shake" may be a contradiction in terms, but who cares! Let us not get hung up on the incidentals, amiright? No Regerts... that's how I like to live my life! It's crazy the things people want to put on their bodies. Personally, I like the ones in Chinese or Japanese and they have no clue what it really says. Yes, a Hot Toddy Shake sounds really good right about now. I'll go with FFDP here. I like the vocals a lot better, although Mandy Suiter has a lovely voice. First four votes out of the chute, and I've got a tie battle so far. It's pretty quiet today for a First of the Month battle. I better call in for some reinforcements. Hopefully they will visit you as well. You haven't even bothered to cast a vote in this battle. What makes you think you're going to vote in any of the others? A little effort, eh? I'm a big fan of 5FDP and I saw them live a couple of years ago. They were fantastic. I'd never heard of Noctura before; they remind me of Evanescence, back in the day. Between the 2 of these I prefer the 5FDP version, I feel it gives the right amount of oompf towards the end. Obviously neither are anywhere near as good as the original. Sorry to hear of your loss. Sometimes it takes more than just lyrics - it takes the right kind of mood music to help us heal. At first I thought I would vote for Noctura simply because my online nickname has been Nocturna (with an N) for the past 20 years or so... but after listening to both version, I can only vote for the powerful FFDP! Yeah! haha! Sometimes it's the little things that help us choose our votes. I try to pick decent songs for battles. Sometimes it's just a crap shoot. Thanks for the vote! I haven't heard of either of these artists but the second, five finger death punch, has lyrics I can really relate to after the loss of my son. Sorry to hear of the loss of your son. It's crazy that both have the same lyrics. But each artist has put their own spin on it. I think that FFDP really does obtain that level of pain that many of us feel in such a tragic loss. I like them both. I can't decide but my husband says he likes Noctura more. Thanks! and tell your husband I said thank you as well. Noctura is taking a beating so far in this battle. Every vote counts. At least it wont be a shutout. Good news - you wont have to wait a full month :) We do battles twice a month, so the next battle will be on the 15th. I'm taking us back to the 70s for that battle. Look forward to seeing you then. I'll vote for FFDP because they are one of my favorite bands, but the truth is I love both of these covers. I like the original also but it doesn't have the same emotional effect these two versions do. I'm giving my vote to Five Finger Death Punch. But I must admit it wasn't an easy decision, both are great! I like the kind of battles that it takes a minute to think about. Thanks for stopping by! FFDP thanks you as well :) This is turning out to be a great battle. Thanks for stopping by! That's the beauty of music. You don't have to be familiar with any of the artists to know if you like them or not. Thanks for the vote! I like Noctura if I to choose between the two. But I really like them both. I guess it depends on your mood at the time of listening. Sometimes it's not an easy choice, but that's part of the fun. Appreciate you taking the time to listen and vote. Not sure of which one to pick, though you hooked me with the title as I recently saw that movie. No opinion? Surely it can't be that difficult to say which of the two you prefer. Sad. Just plain sad. I haven't heard about these two band before. I must have been living under a rock, or probably just too busy living my life. However, after listening to both, I would cast my vote for Noctura. The female lead singer's voice is just fantastic! I agree. There is just something about her voice that makes this song superb. Thanks for dropping by! I've never heard either of the bands, butttt I think my choice is with Five Finger Death Punch! Both seem to have punk rock edge in them, but I'm liking the grunge in five finger death a lot!! Thanks for stopping in to cast your vote :) I like FFDP as well. Great sound. I am not a major music fan, but what I can say is that my money is on Five Finger Death Punch. Hope that you are staying warm from that winter storm. This really does take me back to the hayday of my musical youth. When I was out at the Roxy, Whiskey, Viper Room, or Glass House going to see friends bands, or even friends of friends bands. If I were to vote for either of these I would have to go with Five Finger Death Punch. A good friend of mine just played at the Whiskey a few weeks ago. Thanks for stopping in to cast your vote! I loved both..I really don't want to choose:(. But if I must, oh well, then it's FFDP. Thanks for introducing me to these! I am gonna check them out more. Hey there! Yup, I'm gonna make you choose.. it's really not all that painful now is it? Thanks for stopping by to vote! I agree completely. You can feel the passion coming from someone who has personal experience versus someone that is just 'singing'. Thanks for stopping by!